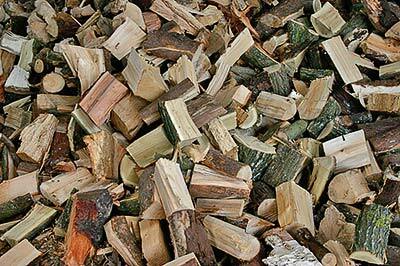 We supply logs cut to size for your open fire or wood burning stove in North Wales. 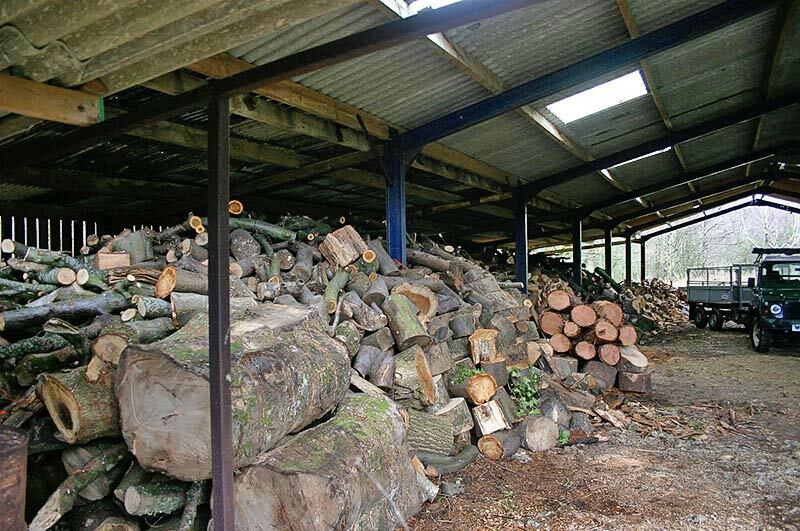 Hardwood logs, or a softwood/hardwood mix (this is our most popular load) are available. Firewood logs can be delivered locally to the Conwy Valley, Llandudno and Colwyn Bay area in North Wales - a delivery charge may apply depending on quantity and distance. 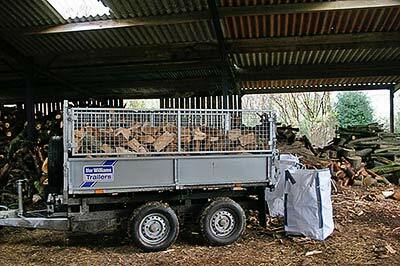 Loose deliveries of firewood are made by tipping trailer or lorry. We sell by volume, not weight (wood gets lighter as it dries out). Please note that the measured volume is the space into which the logs are loaded: because of air space between the logs, this is NOT the same as a solid volume of wood. Our minimum delivery quantity is a cubic metre (a cube with all sides 1 metre in length) into which the cut logs are loaded. The size of load we can deliver may be dependant on access for our vehicle. Delivery locally (within 10 road miles of Dolgarrog) is included within the price: each mile over 10 miles is charged at £3.00. Extra delivery / stacking charges will be added to the price of your load. 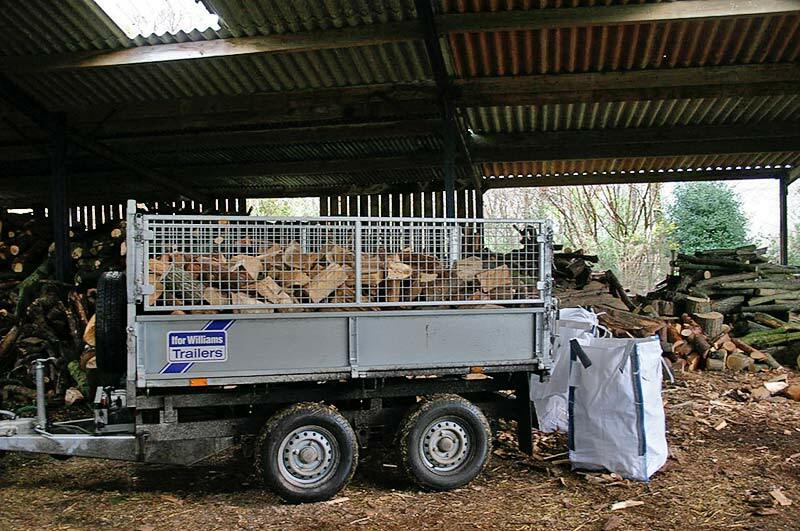 'Delivery' is logs tipped at the nearest hard road or driveway accessible to our vehicle. We offer moving and stacking if required at £20.00 per hour. Available for smaller deliveries. Minimum delivery of 10 bags but subject to small delivery charge. Free local delivery (within 10 miles) on orders of 20 bags or more. Should I Use Softwood or Hardwood? Softwoods (conifers) burn brightly and hot. As they are more likely to 'spit', they are perhaps best suited to stoves. Hardwoods (broadleaves) will usually burn for longer, although different types of hardwood vary. They are often chosen for open fires. Our most popular loads are a softwood / hardwood mix. Fresh timber contains moisture. Timber burns better the drier it gets. Our wood is stored and drying under cover. To aid drying, store your logs under a roof and off the ground to keep the damp out but with good air flow around the sides. Prices include VAT @ 5%. Minimum delivery of 10 bags. £10 local delivery charge on 10-19 bags. Free local delivery on 20 bags or more. Extra charge of £3 per mile over 10 miles. ORDER NOW AND STOCK UP YOUR FIREWOOD STORE.